‘Meltdown. Why our systems fail and what we can do about it’, Clearfield, C., & Tilcsik, A. Atlantic Books, 2018. Excerpt via The Star, 1 April 2018. 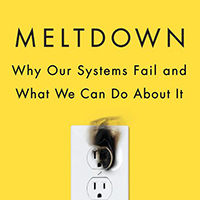 A new book, titled ‘Meltdown’ aims to look at the complexity of “failures”, from catastrophic disasters, to mundane mistakes, and how their commonality can be dealt with in order to avoid future ordeals. “When we shift our opinions to conform, we’re not lying. We may not even be conscious that we’re giving in to others. What’s happening is something much deeper, something unconscious and uncalculated: our brain lets us avoid the pain of standing alone. “These results are alarming because dissent is a precious commodity in modern organizations. In a complex, tightly coupled system, it’s easy for people to miss important threats, and even seemingly small mistakes can have huge consequences. Research cited in the book “suggests that even the faintest sense of power — being in charge of something clearly inconsequential — can corrupt. And it’s just one of many studies drawing the same conclusion. Research shows that when people are in a position of power, or even just have a sense of power, they are more likely to misunderstand and dismiss others’ opinions, more likely to interrupt others and speak out of turn during discussions, and less willing to accept advice — even from experts. “In fact, having power is a bit like having brain damage. As [Dacher] Keltner put it, “people with power tend to behave like patients who have damaged their brain’s orbitofrontal lobes,” a condition that can cause insensitive and overly impulsive behaviour.